A CITY stargazer has won a prestigious young astronomer award. Thomas Killestein received the 2016 Patrick Moore Prize at a meeting of the British Astronomical Association (BAA) in London. 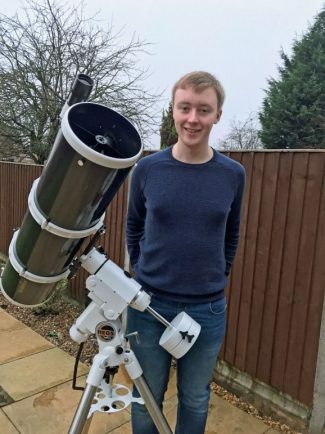 The 20-year-old student, currently studying physics at the University of Warwick, is a keen young astronomer who has produced images of a wide range of celestial objects and promoted astronomy to a wide audience. Tom’s interest in science and the night sky began at an early age, inspired by Sir Patrick Moore on BBC’s Sky at Night. But his interest really peaked when he got his first telescope aged 15. He joined the Coventry and Warwickshire Astronomical Society and has taken impressive pictures of the transit of Mercury, the Orion Nebula, and the September 2015 lunar eclipse. His images of the moon and the North America Nebula have also featured in Sky Notes presentations at recent BAA meetings. Tom now wants to share his passion with local schools and societies. He said: “I am currently the Director of Projects at my university’s astronomy society (Warwick AstroSoc), and regularly lead workshops on the basics of astronomy as well as more technical content like astrophotography and photometry to a diverse audience. “Personally, transient objects like variable stars and asteroids are particularly fascinating for me– both from an observational and theoretical point of view. The Sir Patrick Moore Prize, named after the beloved astronomer, celebrates astronomers who contribute to our understanding of the stars, or who encourage participation.